TACOMA, Wash., Dec. 13 (SEND2PRESS NEWSWIRE) — All Port Jobs (AllPortJobs.com) announced this week the launch of a new job board that covers the spectrum of transportation from aviation and aerospace to maritime, rail, trucking, passenger transit, construction, supply chain logistics and pipelines. 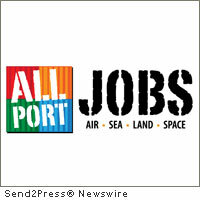 AllPortJobs.com provides a comprehensive listing of transportation jobs in a wide array of industries including airports and seaports; land hubs and spaceports; and everything in between. It’s the Internet’s all-new central transportation job site that, unlike other transportation job boards, consolidates all these jobs in one place. The site is user friendly and allows the job seeker to choose a specific “port” – i.e., air, sea, rail, space, trucking and so on. Popular jobs in each category then appear and job seekers can view what’s available and also narrow their search by location. The site also provides job seekers with the ability to post resumes; receive job alerts; and to view career videos developed and distributed by the Center for Occupational Employment Information (COEI) that are designed to provide a brief, visual introduction of each industry. Even in a down economy, the transportation industry continues to grow. As a result, this is the perfect place for job seekers to turn – it’s an industry to be watched. The transportation industry is global by nature and new technologies continue to evolve to meet its demands. It’s an industry that demands timely delivery and employees who understand the support systems of intermodal infrastructures, especially when disruptions cause serious impact to a company’s process flow. AllPortJobs.com offers millions of job seekers the opportunity to explore their talent beyond their routine plateau – whether through air, sea, land, or a new unchartered territory – space. The staff at AllPortJobs.com is looking forward to witnessing the evolution of routinely transporting commercial astronauts outside earth. They are excited about supporting this industry and to contributing qualified personnel to this historical change. For more information, visit: http://AllPortJobs.com . Original Keywords: AllPortJobs, all port jobs, Washington State Newswire, trucking, space, ship, employment, career, ports, work, workers, directory, transportation industry, Mai T Ho, Tacoma WA, internet, portal, online, web, logistics All Port Jobs Tacoma Washington State TACOMA, Wash.
REFERENCES: Business News, AllPortJobs, all port jobs, Washington State Newswire, trucking, space, ship, employment, career, ports, work, workers, directory, transportation industry, Mai T Ho, Tacoma WA, internet, portal, online, web, logistics All Port Jobs Tacoma Washington State TACOMA, Wash.